This grand residence is located in Los Estados, a private, gated community of 40 luxury detached homes on fairways of the world famous La Quinta Resort and Club's Mountain Course. 77060 Avenida Fernando, La Quinta CA 92253 - On the Mountain Course 17th fairway, 3 bedrooms, 3.5 baths, 3,473 sq. ft. with pool, spa and spectacular mountain view. This grand private home has a majestic view of the Santa Rosa Mountains directly across the 17th fairway of the La Quinta Resort and Club's Mountain Course. This secluded custom estate offers privacy, yet is just steps from the public amenities of the world famous La Quinta Resort and Club. The home's expansive 3,500 interior square feet include three large bedroom suites, a spacious recreation area with regulation pool table, an office/media room, three and one-half baths, living room with gas fireplace, and an open dining area adjacent to the fully-equipped kitchen. The living room, dining area, and master bedroom, also with a gas fireplace, overlook the residence's private pool and spa, and have dramatic views of the Santa Rosa mountains just beyond the 17th fairway, the highest of the resort's famous Mountain Course. The pool lounging area has a gas grill and outdoor dining facilities. Five restaurants and interesting shops are a few minutes walk away. We accept payment by Visa/Mastercard, contact us directly for further information. * 3 bedrooms, all kings. 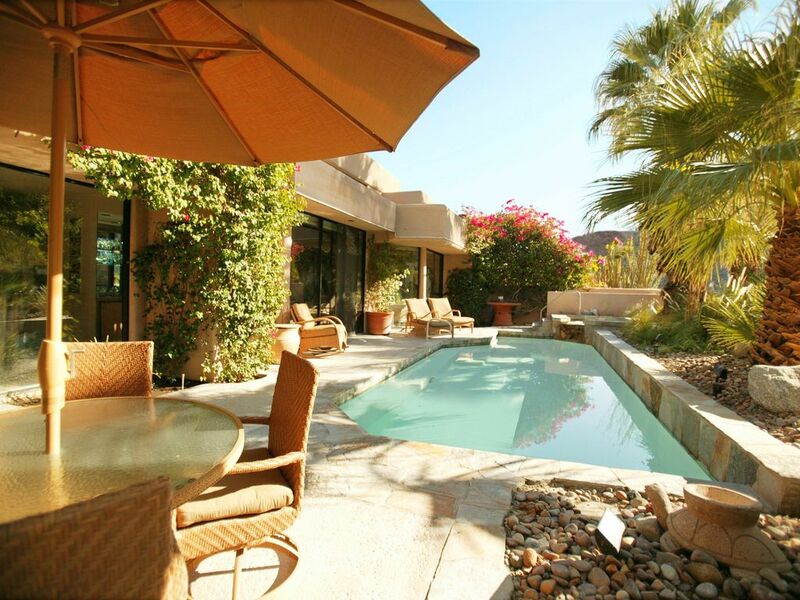 * This home has its own pool with spa for your enjoyment and there is free tennis nearby (contact us for details). * The hotel's public facilities which include restaurants/cocktail lounges, shops, spa, and golf courses are open to the public and available for your enjoyment. * PLEASE NOTE that the Hotel pool, fitness center and their paid tennis are for "hotel guests only'. We are a San Francisco based couple who discovered the unique La Quinta Resort over 30 years ago. We subsequently purchased our home in the gated community adjacent to the hotel with their expansive green golf course vistas, spacious living areas, and great guest entertaining spaces. We cherish being able to stroll from home with our little dog Mojito to the hotel (a five minute walk) where there is always action: morning coffee, brunch, evening music, cocktails, and dinner. We are professional realtors and property managers and have uniquely decorated and equipped our home with vacation visitors in mind. Our super local property manager, will assist with checking in, familiarize you with the property and be on call for any assistance needed during your stay. Glorious sunny weather, what a getaway from snow and rain, w/ beautiful mountains surrounding us. Over 100 golf courses, tennis (including the world famous Paribas tournament a mile away), hiking/biking trails, concerts and music venues year round, it is like being on vacation fulltime. There is something for everyone, and within close driving or walking distance,. The resort is adjacent and you can walk over. There are several restaurants, a coffee shop, entertainment there. Old Town La Quinta is a 10 minute drive, w/ many restaurants and entertainment. Passenger vehicles only. NO rv's, trucks or trailers. Media room has 56' high definition TV + IPOD interface cable. Cable tv, dvd and vcr in all bedrooms. In courtyard area with spectacular mountains views. Courtyard area with spectacular mountains views.